Click for link to George Washington O'Brien's genealogy. After love would say we are all well. May God grant you and yours the same blessing. Sally, I should have written you long since, but have not known your address since you were married until recently. I got it in a letter from Ellen. She says you have a good man which gives me a great deal of pleasure to know it. Sally, I have seen a great deal of trouble as well as yourself since we saw each other. I do hope our worst is over for I do think we have already seen trouble enough for one life. Of course, you know my poor dear boys done very differently from what I always tried to teach them which almost broke my heart. Then, to add to my distress Messrs York and Maul, the men that I was getting railroad ties for when we were all in Missouri, broke up and I lost one thousand and seventy dollars by them and the next summer had four hundred dollars stolen from me which altogether left me poor as a church mouse so that for several years I had a hard struggle to make a living. I am now however, even at this old age (66 years last February) beginning to recover a little and am living tolerably comfortable. I lost my first wife the 9th day of May 1873, lived alone two years and a half, married 20th day of November 1875 a very good and dutiful wife. She died at this place 13th day of October 1884. She left me one little boy, Willie Henderson O'Brien, who was born January 10, 1878. We boarded till the 20th day March, in all a little over four years until I married again. I will not say I have the best wife in the world, but I will say as good as the best. We have a comfortable little home and I think we are enjoying ourselves hugely with our little family. Not so little either. My wife has four children and I have one. Her youngest is five and the oldest 17, and I have one 11 years old. Of course like other children they give their parents some trouble and a great deal of suspense, but not a jar between my wife and me as yet, nor will there ever be. We do not intend to permit it. But now, this is enough of the sorrowful side. During the time I was a widower the last time, notwithstanding my health expenses, I managed to save up about two thousand dollars. We will not, however, do quite so well this year. There are too many in the business and trade a little duller than usual. My daughters are all married and doing tolerable well, some making a living and some gaining a little. Clarinda is living at the same old place. Will is a rustler and Clarinda has in a good measure recovered her good health and they are doing well in the world. Mary married Ben F. Shattuck. They are living near Arlington, fifty miles east of Lebanon, are doing tolerable well. They have lost a great deal of stock horses, cattle and hogs in the last two years which has set them back. Sarah, poor thing has a kind a husband as any and he may not be lazy, but only born tired. They are only making a living. They are living at Corwith, Iowa. Luona Josiphene has given up her wild ways and is now living a very steady and religious life and trying to make her husband a good wife. They live at St. Paul, Ark. and from their letters, I suppose they are making something more than a living. None of the girls know how poor Ben died. They only know he is dead. In fact, Sally, I know but little about it myself. Will you please write me all about it. What were the charges against him? Did he have a fair trial? Was he persecuted much by his enemies? Who were they and why did they persecute him? Were his attorneys true to him? When he wrote me last, he said you was true and faithful as a wife. Could be I should have been with him, but it was soon after I had my severest reverses and I was helpless for want of means. It almost broke my heart, but I could not help myself. But now I have already written too long a letter. Please write soon. Let me know how you are doing, how my dear grandchildren are doing. How many is there of them? What is their names? Are they good and smart? Hope I shall be able to see them all sometime. Ellen says your oldest is married. Oh, how time flies. If you answer this promptly, I will try to send you some pictures next time. Hope you still believe me as ever a fond father and grandpapa. George Washington O'Brien was born in Brown County, Ohio (as were his parents) in February 1823. He first married Nancy D. Tribble. Nancy was the daughter of Rob and Mary Tribble and was born in Tennessee or Kentucky on 24 December 1824. G.W. and Nancy had at least six children. Nancy died in Lebanon, Missouri on 9 May 1873 and is buried in the Lebanon cemetery, north of North Gate. G.W. married his second wife, Mrs. Rebecca Henderson Sliger on 21 November 1875. They were married in the Heards School House in Laclede County. She was born on 23 June 1839 and died on 13 October 1884 in Batesville, Arkansas. G.W. and Rebecca had one child, Willie Henderson O'Brien. G.W. was married for the third and presumably last time to the 39 year old Mrs. Mary Henrietta Grimes in Batesville on 21 March 1889. Mrs. Grimes had five children from a previous marriage living at home. Her first husband may have been Elihu A. Grimes. It is not known if G.W. and Mary Henrietta produced any offspring. G.W. lived in Indiana at least as early as July 1845 and possibly as early as 1842. He remained in that state until about 1857 when he moved to Missouri. In July 1870, he lived in Lebanon, Missouri where he served as Justice of the Peace. He was also in the business of procuring crossties for the partnership of York and Maul. It is not known exactly when G.W. came to Lebanon, but it seems more than coincidental that he was in the crosstie business and bought property in that town three weeks before the railroad arrived. On 28 September 1869, G.W. paid $200 for Lot 10 of Block 8 in the First Railroad Addition. The railroad, which was moving westward from St. Louis, brought its first passengers to Lebanon on 20 October 1869. It is interesting to note that a John and Patrick O'Brien of Phelps Co., Missouri and Edward O'Brien of St. Louis also bought city lots in the same addition some six weeks earlier. No relationship to G.W. is known at this time, but the pattern of western settlement existent in those days suggests kinship. It is further interesting to note that one of the marriages performed by G.W. while acting in the capacity of Justice of the Peace was Daniel O'Brien to Nancy Cox on 1 July 1870. It is not known how long G.W. remained in Lebanon or where he went from there. It is known that he suffered some financial reverses while he was in Missouri. When the partnership of York and Maul was dissolved, he lost $1070 and the following summer someone stole 400. These losses, which left him virtually destitute, must have occurred sometime before 1880. G.W. in a letter to his widowed daughter-in-law, "Sally" (the former Mrs. Benjamin F. O'Brien) says that these incidents occurred shortly before Ben died. Ben is believed to have died sometime between 1877 and 1880. G.W. moved to Batesvillle, Arkansas, around 1883 or 1884. It is perhaps significant that the St. Louis, Iron Mountain & Southern Railway Company came to Batesville in 1882. In 1889, G.W. was in a partnership with W.R. Pickering and E. Short. Short, Pickering and O'Brien were in the Red Cedar Post, Pole and Piling Business. These products would have been used by many diverse people in a growing country, but almost certainly by westward expanding railroad. After the death of his second wife, G.W. and their son Willie boarded for about four and a half years. Apparently he was still trying to recover from his financial losses in Missouri, for there is no evidence that he purchased property during that time. On the same day in 1889 he married Mrs. Grimes, he bought Lot 6 in Block 20 in the Charleston Addition to Batesville for the sum of $500. His new wife may have had some financial interests of her own, for the record indicates that a Mrs. Mary Grimes had sold city lots 5, 6, 7 and 8 in Block 6 on 13 June 1885. On 1 June 1889, G.W. bought lots 5, 6, 7 and 8 in Block 11 for $1600 cash. Two leaks later on 14 June, G. W. and Mary apparently borrowed $1200 on the property and signed a promissory note to William J. Erwin. The $1200 was to be paid back at the end of two years at 10% interest per annum. In G.W. 's letter to Sally on 12 July 1889, he states that he felt that business would not be as good that year as it had previously. Apparently he was correct, for the record indicates that he did not pay the debt and ultimately had to liquidate all of his property in the next few years. The following year on 19 June 1890, G.W. paid Erwin $120. This figure apparently represent the 10% interest on teh $1200 principal. The next year on 27 June 1891, he again paid $120. There is no record of an interest payment in 1892; however, on 7 March 1893, he and his wife deeded Lot 6, Block 20 to Erwin for the sum of $250. This was apparently done to cover interest payments due Erwin for 1892 and 1893, but it represented a $250 loss on the property for G.W. There is no record of any interest payment being made in June 1894. A notation was made on 13 February 1894, but it is unclear whether an interest payment was made on that day, since no dollar amount is indicated. Finally, on 31 May 1895, the property secured by the deed of trust was deeded over to Erwin for the sum of $1,000. It is unclear how or when G.W. became a partner with Short and Pickering. No record has been found where he bought into the partnership. It may be that his wife was a silent partner and he acquired an interest when they married. The letter to Sally is written on company stationary that lists Short and Pickering as owners. A note written by G.W. in the margin says that it should read "Short, Pickering and O'Brien." It is not known when his partnership was dissolved, but it may have been in 1892. On 22 March, G. W. and wife deeded their one-third interest in lots 6, 9 and 10 of Block 1 in the Old Town of Batesville to Short and Pickering for the sum of $100. If G. W.'s financial pursuits were less than successful, his endeavors in other fields proved more fruitful. In Missouri, he served as Justice of the Peace. In Batesville, he was an Elder and Trustee of the Church of Christ. The last known record of G.W. 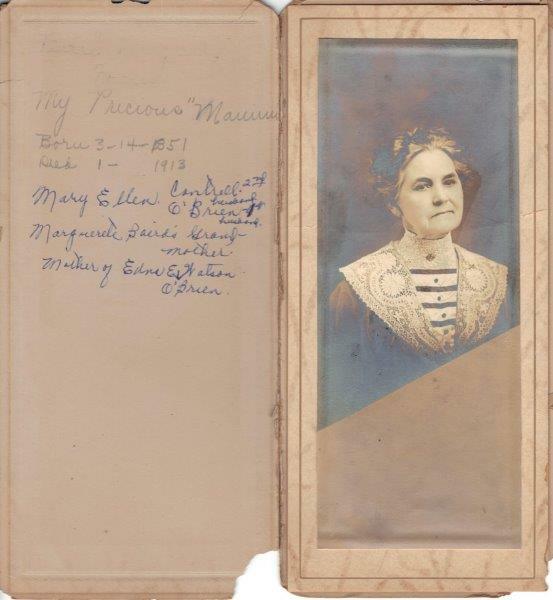 and Mary in Batesville was 13 May 1895. On that date, they deeded property to William J. Erwin. It is known that G.W. was still living on 29 December 1901 and was visiting Mrs. Bertha M. Conoverin Westley, Iowa. Berta was the daughter of his fifth child, Sarah. In April 1910, he was living with Sara E. Hussong in Corwith, Iowa. He died April 27, 1912 in Fort Dodge, IA. He is buried in Corwith, Iowa. I. Clarinda J. O'Brien. Born 27 July 1845 in Indiana, died on 6 November 1906 in Camden County Missouri. She married William J. Sweatt. "Will" was born on 3 October 1846 and died 31 October 1905. They lived in Dry Glaize, Missouri, North of Lebanon. II. Benjamin Franklin O'Brien: Born about 1848 in Indiana. Married a widow, Mrs. Sarah "Sally" Josephine Fitzgerald Hart on 31 May 1869 in Lebanon, Missouri. They met in Missouri when Sally, and other family members brought cattle from Texas to the market. They settled in Hood and or Hunt County, Texas. Family tradition says Ben "died in prison of the bloody flux." There are conflicting stories relating to the reason for his incarceration. One says he was jailed for attempting to "bribe a sheriff to set a relative free", another says his horses were rustled. After recovering his and others that had been stolen, he was charged with the theft of the other horses. Another story is that he was shot by a lawman crossing a river with a gang of outlaws. Ben died in 1878. Sally later married Andrew Jackson Brownlee. She died on 23 June 1928 in Midland, Texas, and is buried near Hereford, Texas. V. Sarah E. O'Brien born January 15, 1855 in Indiana. Married at least twice. 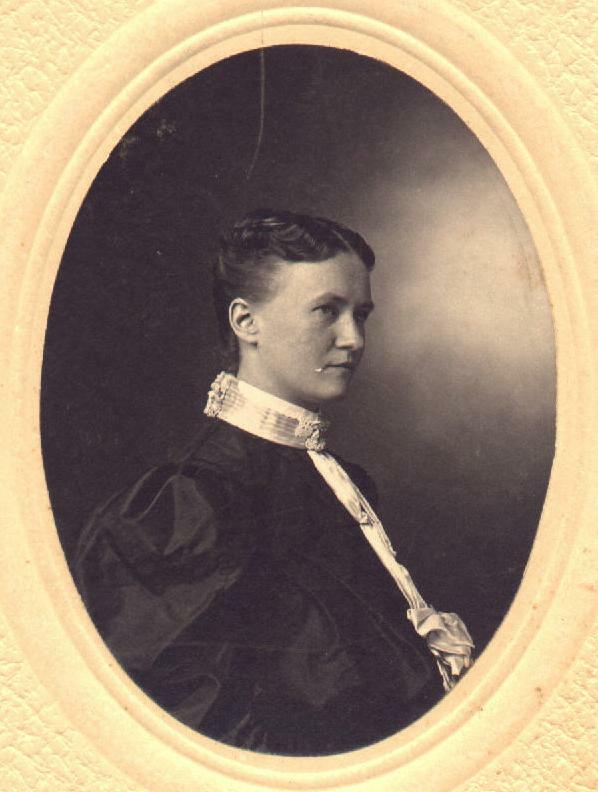 She lived in Corwith, Iowa, in 1889 and is buried there. She died 10 May 1916. VI. Luona Josephine O'Brien born 1859 in Missouri. She married and was living in St Paul, Ark. in 1889. Children of George W. O'Brien and Rebecca Henderson Sliger O'Brien m. 11/21/1875 b 6/23/1839 d 10/13/1884 Batesville, AR.